Fig & Date Press for sale. Buy online at Zingerman's Mail Order. Gourmet Gifts. Food Gifts. There may be a lot of dried fruit with nuts out there looking trendy these days but this is no fad. This is something you might have found a hundred years ago in a market in Istanbul, Cairo, Athens or Palermo—albeit rarely done this beautifully. 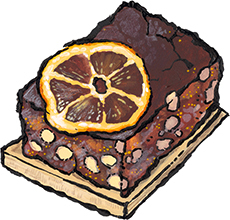 Two different varieties of dried fig (Black Mission and Green Turkish) along with dried dates, almonds and hazelnuts to create a pressed cake that’s as gorgeous to behold as it is mouth-watering to eat. Slice and serve this darkly sweet cake with your favorite cheeses like Comte or Manchego. It's also a great pair for blues like Stilton. You can even cube it up and toss into salads, stuffings, or serve straight as a simple dessert. Makes a great host gift.